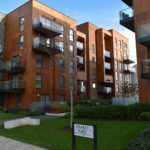 A Kisiel Group development in West London has received a Gold Award from Secured by Design (SBD), the national police crime prevention initiative, for incorporating crime prevention techniques into the landscaping and physical security of its buildings. The Treebank Garden development in Hanwell saw the construction of four new build houses on land which had originally been garages. The houses, two sets of two four-bedroomed semi-detached houses, also have basements which have been turned into spacious master bedrooms. An SBD trained designing Out Crime officer, who is employed by the Metropolitan Police Service, worked with the Kisiel Group throughout the construction to assist with security features to reduce the opportunity for crime and anti-social behaviour. This work included incorporating proven crime prevention techniques in the layout and landscaping, such as to increase natural surveillance, create defensible space and ensure the areas outside the houses had appropriate lighting. A small courtyard at basement level created an additional outdoor space which allowed light into the bedroom. By putting in a glass barrier, it maintained the privacy and security of the homes. There are three levels of SBD award: Gold, Silver and Bronze. The Gold Award is the highest level and it is awarded where the physical security specification of the home is enhanced by the security provided in the external environment. Annie Summun, a Kisiel Group Director, said: “Members of the Kisiel team have worked closely with the Metropolitan Police to ensure that the procurement of items such as doors, windows and locks met with their strict standards. “As the houses have basements and are set back from the road in a small cul-de-sac, it was important to consider security from the start. The external areas were assessed and recommendations were actioned so that the application was able to meet the rigorous standards set for the Gold Award. “We undertook all the recommendations given to us and were delighted when we were awarded a Gold Award”. Met Police Designing Out Crime Officer, Stuart Hutchinson, said: “I am very pleased this development has achieved a gold award. The proven techniques for crime prevention have been implemented by Kisiel Group, and not only have they used accredited doors and windows, but also taken our advice for the design and layout. The Kisiel Group was founded in 2007 and is a London based Design and Build Construction company. Their client focus has meant recommendations and referrals, and this has established them as a company over the last decade that is trusted to deliver a quality refurbishment, a stunning extension or a sustainable new build. As a Chartered Building Company, they offer a friendly and professional service at a fair and transparent cost. They can advise on anything from an extension to a major refurbishment and aim to be a contractor of choice for a variety of construction projects. Secured by Design, the national police crime prevention initiative, aim to achieve sustainable reductions in crime through design and other approaches to enable people to live in a safer society. We work in partnership with National and Local Government, British and European standards authorities, trade associations, the construction industry, manufacturers and many other organisations to reduce crime and the fear of crime by incorporating proven crime prevention techniques into the built environment. We have more than 200 SBD trained police officers and staff in Police Forces around the UK. These Designing Out Crime Officers work with architects, developers and local authority planners to build in tried, tested and proven crime prevention techniques at the planning stage to reduce crime and keep communities safe. SBD seeks to reduce crime by combining minimum standards of physical security like doors, windows and locks that achieve SBD’s Police Preferred Specification standard and proven design principles of the built environment such as natural surveillance and defensible space. Whilst police are unable to recommend specific products, SBD can act as an effective gatekeeper and signposting service to our 650 member companies and their products, which meet our rigorous Police Preferred Specification standards. Members’ products range from secure and robust doors, windows and locks through to cutting-edge IT products, CCTV components, and shutters and barriers. SBD is the only way for companies to obtain police accreditation for security products in the UK. SBD developments include such iconic sites as the 2012 London Olympics, Wembley Stadium and the Welsh and Scottish Assembly buildings.